I've always tried to pamper my feet and pedicures are probably one of my favorite activities, ever... and since I really don't like feet (I'm weird, I know), I feel like having pretty feet makes them a little less ugly and weird looking. Having dry or cracking feet is a big no-no in my book, cracked polish on your big toe - UH, no! Even though it's fall and we all plan on rocking boots and closed toed shoes, it's still important to have your feet looking good when the socks come off! 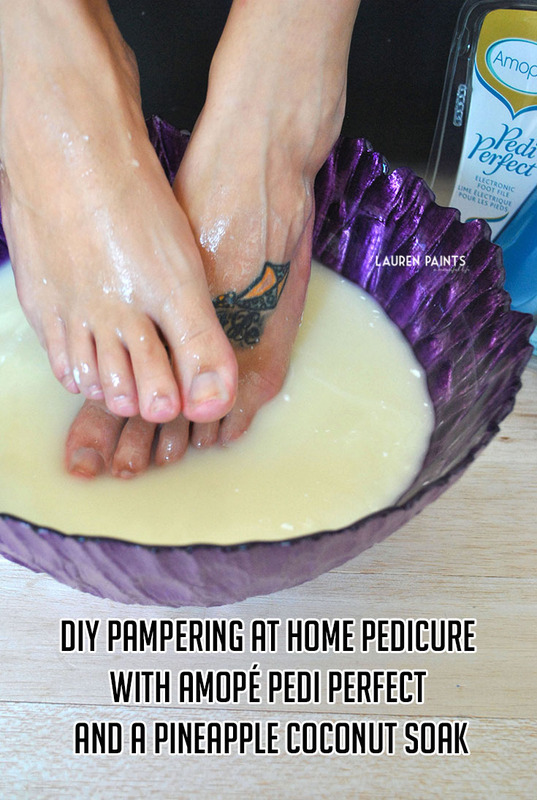 Instead of hitting the salon weekly, I've finally found a new way to get my super pampering pedis in at home! I found this little gadget at Target and I was so excited I headed home and decided it was time for a spa day immediately! I applied a face mask, got the polish out, poured some pineapple and coconut juice (not for drinking, read on for a super fun pedicure tip) and it's pedicure time! I recently heard that pineapple is good for your nails; it sounds a little crazy, I know, but I did a little research and decided to start my pedi with a fabulous, all-natural pineapple, coconut soak. Pineapple stimulates the production of anti-inflammatory properties and contains chemicals that prevent tumors according to The Doctors; while coconut helps moisturize stubborn skin and it's anti-aging properties revitalize skin. Oh and did you know coconut milk can also serve as a make up remover, conditioner, and more? So now that you know what this delicious smelling footie cocktail will do for you, it's time to mix it up and let your feet dive in. Mix together 3 cups of Organic Pineapple Juice, around 1 1/2 cups coconut milk, and around 4-5 cups of hot (warm) water. Stir this mixture together inside a deep container and place your feet in the soak. I allowed my feet to soak for around 10 minutes, letting the pineapple soften my cuticles and brighten my nails while the coconut milk softened my skin. You will really notice a difference when removing your feet from the mixture. After soaking, dry your feet with a towel and push back cuticles. Next on the line up is the star of the show, the Amopé Pedi Perfect is what I use to buff the dry skin and callouses from my feet. This easy to use gadget is what makes my at home pedis so much better than one at the spa. I'm able to buff away the rough spots on my feet with the specially designed Micraumina head without it being painful or too aggressive. I'm obsessed with how soft and healthy my feet feel after use, especially after I applied the Amopé foot cream. If you're looking for a way to spoil yourself or your closest gal pal, I highly suggest you #RespectUrFeet and pamper both of you with an Amopé Pedi Perfect. 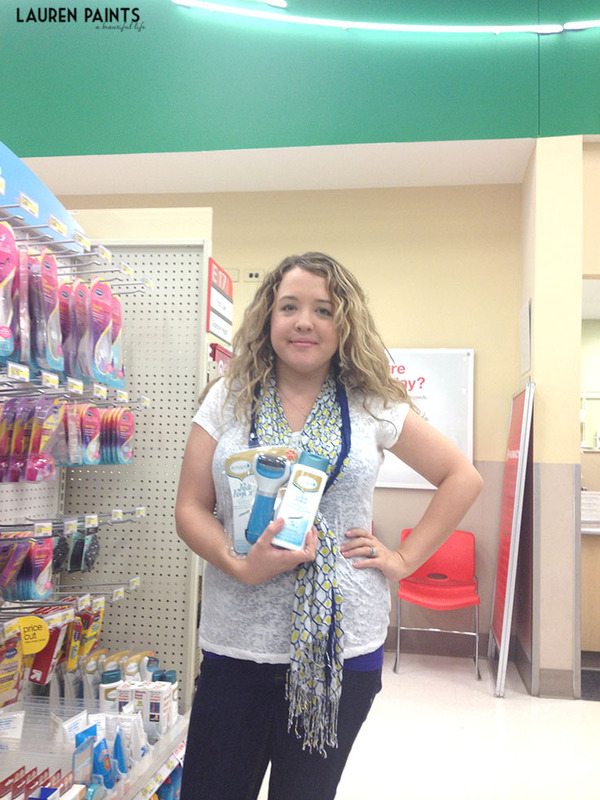 You can find this new at home pedicure gadget at Target in the foot care aisle. Plus right now through the 11/22 you can score a $5 gift card and 10% off using the Target Cartwheel app. The last step in this super pampering pedicure is getting creative with polish! I decided to paint my toes with a super fun Fall inspired pedi and I'm sharing a simple tutorial on how I painted these super cool leaves onto my toesies.